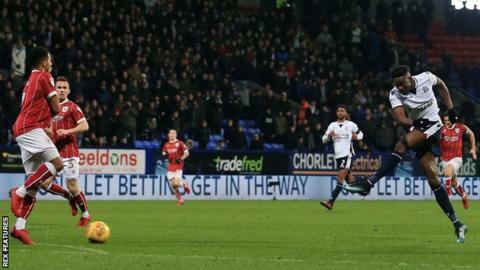 Sammy Ameobi's brilliant individual goal was enough to help pull Bolton out of the Championship relegation zone with victory against Bristol City. Ameobi netted his first goal for the Trotters since October with a fine run and low finish in the second half. Defeat for promotion contenders Bristol City saw them miss the chance to close the gap on the top two. Bobby Reid was denied what appeared to be a penalty early in the game when Ben Alnwick collided with him. Bolton climb to 19th with the victory, which came in the week they sold leading scorer Gary Madine to Cardiff City for £6m. The win was the first in a league game Phil Parkinson's side had managed without Madine in the side since April 2016. Ameobi provided the only goal of a cagey game after he won the ball on the edge of his own penalty area and was allowed a free run before shooting from 20 yards out. He came within inches of a spectacular opener in the first half with a curling left-footed effort. Zach Clough, who returned to Bolton on loan from Nottingham Forest on transfer deadline day, should have made sure of the points late on with a second goal, but failed to keep his effort on target. Bristol City struggled for rhythm and Famara Diedhiou's second-half header from close range was well saved by Alnwick. The Robins stay fifth before the weekend's other Championship fixtures, three points behind second-placed Derby County. "We showed great resilience. People have written us off all season. We have sold our top scorer and people are writing us off again, so we have to prove them wrong again. "It felt tonight before the game that people were patting us on the back and saying we were unlucky. "I said I expected us not to draw, but win the game. Everybody will talk about Sammy, who will get the headlines, but it was a team effort and the players stuck to our game plan and restricted a very good team to few chances." "I didn't like our performance and I didn't like our players' attitudes. "I thought we pulled out of a couple of tackles early, I thought we played into their hands and we didn't get in behind them enough. "You have to credit Bolton, they were excellent. I thought Sammy Ameobi was the best player on the pitch, which was disappointing." Match ends, Bolton Wanderers 1, Bristol City 0. Second Half ends, Bolton Wanderers 1, Bristol City 0. Sammy Ameobi (Bolton Wanderers) is shown the yellow card. Dorian Dervite (Bolton Wanderers) is shown the yellow card for a bad foul. Gustav Engvall (Bristol City) wins a free kick on the left wing. Hand ball by Ryan Kent (Bristol City). Foul by Gustav Engvall (Bristol City). Substitution, Bristol City. Gustav Engvall replaces Famara Diedhiou. Attempt missed. Famara Diedhiou (Bristol City) right footed shot from the centre of the box is high and wide to the right. Assisted by Korey Smith. Attempt missed. Zach Clough (Bolton Wanderers) right footed shot from the centre of the box is just a bit too high. Assisted by Sammy Ameobi. Attempt missed. Famara Diedhiou (Bristol City) with an attempt from the centre of the box misses to the left. Assisted by Joe Bryan with a cross. Substitution, Bolton Wanderers. Filipe Morais replaces Mark Little. Corner, Bristol City. Conceded by Ben Alnwick. Attempt saved. Josh Brownhill (Bristol City) right footed shot from a difficult angle on the right is saved in the bottom right corner. Attempt saved. Aden Flint (Bristol City) header from the centre of the box is saved in the top left corner. Assisted by Bobby Reid. Corner, Bristol City. Conceded by Derik. Goal! Bolton Wanderers 1, Bristol City 0. Sammy Ameobi (Bolton Wanderers) left footed shot from outside the box to the bottom right corner. Assisted by Antonee Robinson following a fast break. Corner, Bristol City. Conceded by David Wheater. Foul by Antonee Robinson (Bolton Wanderers). Karl Henry (Bolton Wanderers) wins a free kick in the defensive half. Ryan Kent (Bristol City) wins a free kick on the left wing.